Testimony presented to the House Appropriations Committee, Subcommittee on Transportation, Housing and Urban Development, and Related Agencies on May 18, 2017. 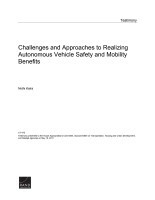 Kalra, Nidhi, Challenges and Approaches to Realizing Autonomous Vehicle Safety and Mobility Benefits. Santa Monica, CA: RAND Corporation, 2017. https://www.rand.org/pubs/testimonies/CT475.html.